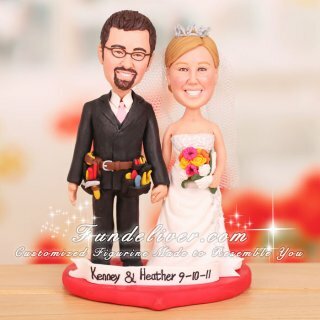 This is a completely customized construction theme wedding cake topper ordered by one of our customers. The groom's tux is black with an ivory shirt, he is a handsome construction worker so they would like to put a tool belt around the groom's tux. The bride is wearing an ivory dress, holding a bouquet with white hydrangea, hot pink gerbera daisy's orange and yellow roses. It is quite funny to arrange the tool belt during the whole designing process. From their first idea the bride would like to have the groom in a Cubs tee shirt with baggy khaki shorts, the tool belt hanging on his hips with his tux jacket over it. The bride’s parents love this design, however the groom doesn’t. The groom prefers the tux version with the tool belt outside of the tux. Do you have similar problem? Have many ideas but don’t know which one is the best? Don’t worry, we can work it out. Several 2D sketches will be designed based on your ideas to help you choose the best one. 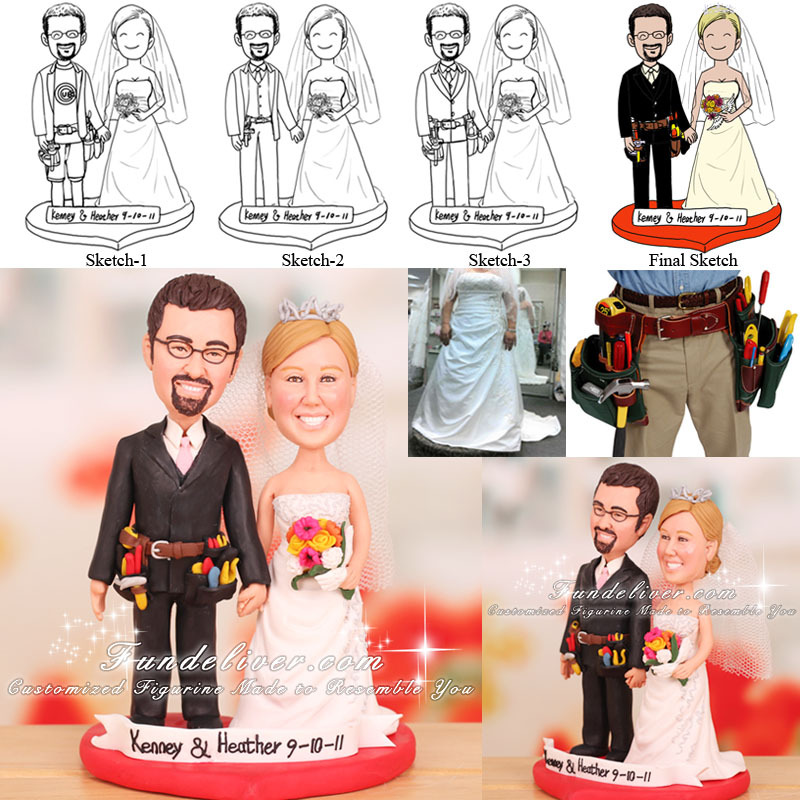 Just send us your ideas and reference images, we can work with you together to make your wedding cake topper perfect.